1 Intex Pure Spa Chemicals – What Chemicals Do I Need for My Hot Tub? Intex Pure Spa Chemicals – What Chemicals Do I Need for My Hot Tub? Here is a break down of all of the chemicals and filters you’ll need to keep the water in your spa in good condition. If you’re running into problems maintaining your hot tub, see our article on Hot Tub Problems and their Solutions. The first thing you’ll need to do is test your water with a water test kit to see what the current water chemistry is looking like. 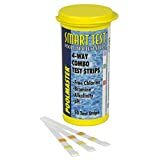 To use these test strips, simply insert a strip in the water for a few moments, and the color of the paper will transform to the status of the current level of each of these attributes. Then hold up the strip to the chart on the exterior of the bottle, and compare to the target levels. Note: Be sure you don’t get water from your hands or from a test strip into the bottle, as that will ruin all of the strips in the bottle. Cap the bottle after you take out one of the strips. Once you know the pH level of your water, you can see whether you need to send the Spa Up [Amazon Link] or Spa Down [Amazon Link] to balance it and get it at the appropriate level. These chemicals will help balance the pH of the water, will prevent cloudiness, and will adjust the alkalinity of the water. If you overshoot the quantity you add, you can add clear water, or use some of the opposite chemicals to get things back in balance. If your water is cloudy, or if you’ve just filled the Intex PureSpa with fresh water, you should probably add some RENU2 Spa Shock chemical [Amazon Link] to your water to get it in the right chemical makeup. This LeisureTime Spa Shock is compatible with both chlorine and bromine treatments and works well at clearing out microorganisms, algae, deodorants, oils, and other nasties. This chemical does not impact pH levels, which is helpful. Depending on whether you keep your spa indoors our outdoors, and your personal preference, you’ll want either Bromine or Chlorine tablets. These tablets disinfect your water and keep it crystal clear. Usually, Bromine is best for indoor spas, and Chlorine best for outdoor spas, but you can use either, depending on your preference. If you want to dig deep, you can get more information here. We like the Arch Chemical HTH Brominating Tablets [Amazon Link]. Simply place these tablets in the floating chlorine/bromine dispenser that came with your Intex PureSpa hot tub, and the tablets will gradually dissolve into the water, cleaning and sanitizing as you go. These tablets are about 1.25″ in diameter. Depending on how far you are from ideal on your test strip, add more or less of the bromine tablets to the dispenser. If your test strip shows too much bromine, you can pull the tablets out until it gets to a balanced level, or add more water. If your spa is outside, you’ll probably want to use Chlorine to keep it clean and sanitized. 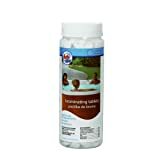 We like these Clorox Spa Chlorine Tablets [Amazon Link], as they are easy to use and work well. These tablets are 1″ in diameter. To use these tablets, just insert some of the tablets inside the Intex chlorine/bromine floating chemical dispenser, and leave them in the dispenser to float in the water. Depending on your distance from ideal on the test strips, place more or less chlorine in the dispenser. If you overshoot, remove the dispenser and wait a little while, or add some clean water. If you don’t currently have a floating chlorine/bromine dispenser, be sure to pick one up when purchasing your tablets. We like the Life Delux Spa Chemical Dispenser. It will do chlorine, bromine, etc, and has an adjustable flow control to dial in just the right chemical dispersal rate for your needs. It is compatible with 1″ tablets. 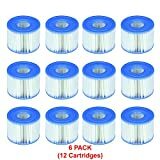 This dispenser is positioned at a good price point and is pretty simple to use. About six tablets can fit in at a time, and you can tailor the flow to the size of your hot tub. This dispenser uses 1" bromine or chlorine tablets. With some test strips and a few chemicals, you’ll be able to keep your Intex PureSpa in great shape for the entire season. While you’re thinking about Intex PureSpa Chemicals, you may want to pick up some spare Intex PureSpa S1 filters [Amazon Link], as well, as these help keep the spa clean. 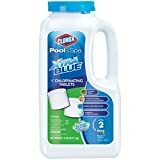 I bought those Clorox chlorine tablets from your link, but they’re the 3″ kind, and the floater is 1″. Now I’ve got useless tablets. Our deepest apologies for the the error! It seems we grabbed the wrong link when putting that page together. The post is fixed now, thank you for alerting us to the mistake.